We’ve had a pretty mild winter thus far around here. Today, though, I have a snow day so I’m catching up on a post I started writing ages ago. This post is about nursing my Japanese indigo plants through the frosts in the fall. 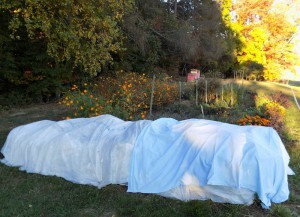 When the first frost was forecast on October 10, 2015, I bundled up the plants nice and snug.